New York neon underglow usage is governed by the state's Code. All relevant laws, rules and regulations pertaining to vehicle lighting including car underglow in New York have been provided below. Make sure to examine the regulations carefully and do not use any restricted lights. Usage of neon underglow lighting is governed by New York Laws, VAT – Vehicle & Traffic, Title 3: [...] Equipment [...], Article 9: Equipment of Motor Vehicles and Motorcycles, Section 375: Colored and Flashing Lights. Is neon underglow legal in New York? All after-market lighting including neon underbody glow can only be white-colored, and all other colors are against the law. If stopped by a police officer and in case of LED underglow which can change colors, we strongly suggest never telling you can change colors. Even mounting lights capable of displaying any color other than white could be considered against the law in New York. Never use blue, red or green underglow as these colors are used on emergency vehicles. There are no relevant NY laws which specifically restrict or prohibit installing car underglow, meaning we consider it legal to use it while driving. Below are all relevant excerpts from New York Vehicle Code that limit, restrict or allow certain aftermarket lights to be installed on vehicles. 41. Colored and flashing lights. The provisions of this subdivision shall govern the affixing and display of lights on vehicles, other than those lights required by law. 8. The provisions of this subdivision shall not be applicable to the driver of a vehicle from another state or foreign jurisdiction which vehicle has colored lights affixed but not revolving, rotating, flashing, oscillating or constantly moving if the lights on such vehicle comply with the laws of the state or home foreign jurisdiction in which the vehicle is registered. Subsection 8 allows the use of all colors on aftermarket vehicle lights such as neon underglow in case the vehicle is registered in another state where such lights are permitted. Our information about car neon underglow laws in New York was last updated in 2018 and checked in 2019. In case any info we provided is not up to date or correct be sure to contact us so we can revise it. Thank you! Check our data with your local law enforcement or other relevant agencies! 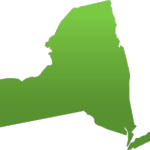 New York underglow laws in certain cities or counties may be different from state legislation. While we do our very best to provide the most accurate information about LED and neon street glow usage we will not be held liable for any potentially incorrect or misinterpreted info. Have questions about traffic or neon glow laws in New York?